Of the countries that I have visited to date, Italy tops my list. What I love most about the country in general are the welcoming people, plethora of history and ruins, and amazing food. Additionally, you can also find beaches, ridiculously beautiful countryside scenery, and great shopping. 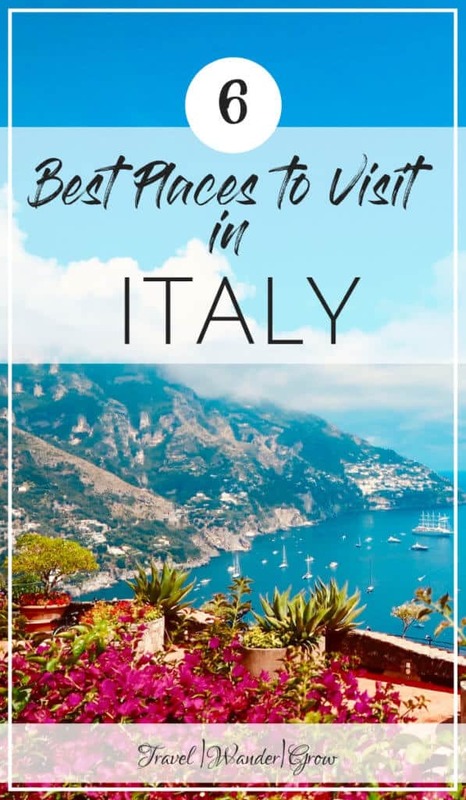 As you can see, there is no shortage of reasons why Italy continually tops the list of most-visited international destinations in the world. 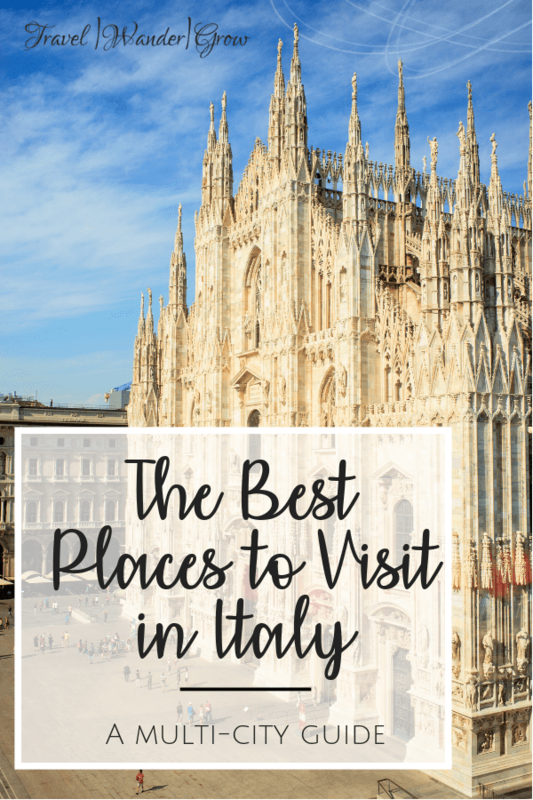 In this article I will cover the best cities to visit in Italy, from my perspective. As I have not seen the entire country yet, I will add / modify as I have new experiences there. 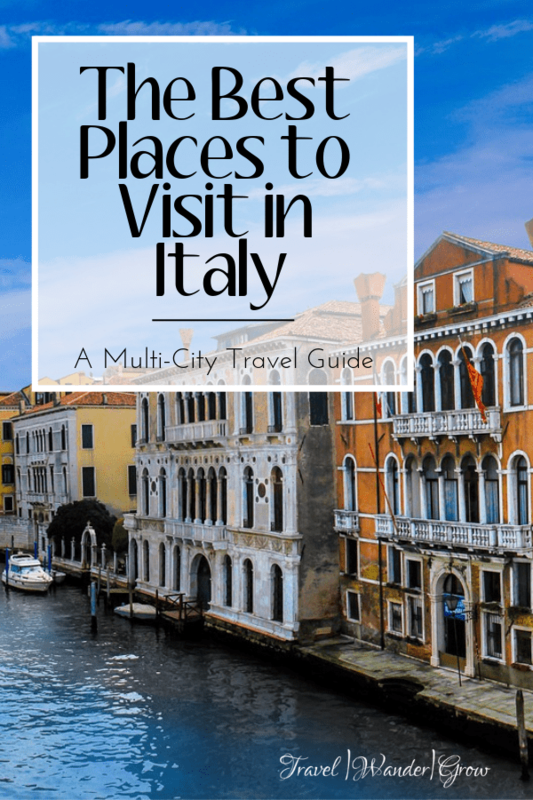 Getting Around: If you are traveling to multiple cities in Italy, the best way to see the country (by far!) is by train. This is mainly because the train system is just so efficient and affordable. Also, as I mentioned above, the Italian countryside is beautiful and you can easily observe it while on the train. What I like best about train is the fact that its just much less hassle than taking a plane. You don’t have to arrive far in advance of your departure and don’t have to worry about long security lines. If the train interests you, head over to trenitalia.com to find your ticket! When to Go: As Italy is a really popular destination, it tends to have large crowds – especially in the summer. I recommend visiting towards the end of spring or early fall. That will allow you to avoid massive groups of tourists, but still have great weather. Currency Situation: Italy uses the Euro, like many European countries. The current exchange rate is €1 = $1.16. Click here for the latest exchange rate. Although credit cards are accepted in many places, I recommend that you take out some cash while there. I found that it was just easier to make many purchases with cash on hand. Language Considerations: The language of Italy is Italian (as I’m sure you know). English is spoken by many in the larger cities, but you will often encounter those who don’t speak it, even in cities as large as Rome. It is really helpful to know some basic phrases before your visit so that you can greet locals correctly. It never hurts to use the local language when you can! Check out my guide on Italian sayings for tourists to make sure you’re prepared!. When most people think of Italy, they first think of Rome. Rightfully so, as this was the center of the massive Roman Empire that dominated most of Europe, Northern Africa, and the Middle East in ancient times. 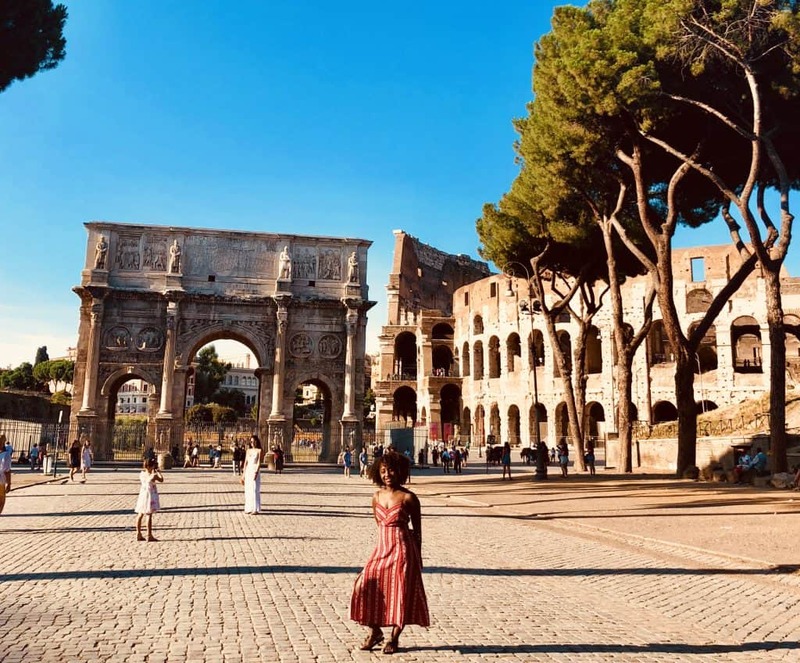 The Colosseum: What is a visit to Rome without a stop at il Coloseo? This massive amphitheater is the largest one ever constructed – to this day! During its heyday, it was used for gladiatorial shows, dramas, animal hunts, and mock sea battles. Despite the fact that it was partially deconstructed during the middle ages, it is still one of the most impressive ancient sites you’ll find anywhere. The Roman Forum and the Palatine Hill: This archaeological site served as the center of life in the ancient center of Rome. Here, you’ll find ruins of buildings such as the House of the Vestal Virgins, the Temple of Caesar, and the Regia. Visit here to literally walk through the streets of ancient Rome. You can see the Palatine Hill and the Roman Forum together, as they are sold as one ticket. This area was the home of wealthy Roman citizens and emperors like Nero and Augustus. The Vatican Museums: These museums, which are connected into one very large museum, house art and other objects collected by wealthy popes over the years. The pièce de résistance of the museums is the Sistine Chapel, which is situated towards the end of the long hallways of the museum. The Vatican Museums are located right outside of St. Peter’s Basilica, which is another very well-known Roman site. 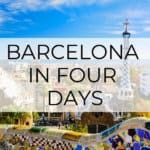 These museums are the 4th most visited in the world, so I recommend booking your ticket in advance to save you a bit of stress and time waiting in line. I get really into the details on what to see/do in Rome in this post. Check it out if you want to learn more! Out by the Colosseum and the Arch of Constantine. Florence is known as the city where the Renaissance began. An interesting fact about Florence is that the dialect spoken here is the one chosen above all others in Italy as “standard” Italian. Florence Cathedral: This is “the” main attraction of the city, and also the 4th largest church in the world. This cathedral is a full complex, featuring the Baptistery and Giotto’s Campanile. The building is absolutely gorgeous inside and out and certainly worth a visit when you are in the city. Piazzas, Piazzas, Piazzas: Like all Italian cities, Florence has many squares throughout the city. Visit the Piazza della Repubblica to visit the center of the city, which was once the site of the ancient Roman Forum. Head over to the nearby Piazza della Signoria to see the Palazzo Vecchio (town hall) and experience a sort of outdoor museum. I’ll note that I personally love piazzas because the people-watching opportunities are great! 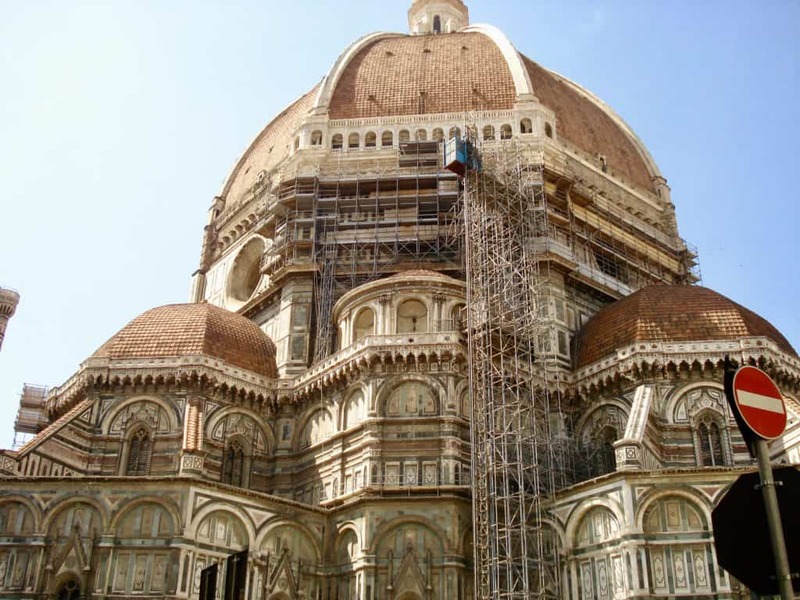 The Florence Cathedral – There was a bit of construction taking place during my visit. Venice is well-known for being situated in the sea, with water ways, water taxis, and gondolas featuring as the primary methods of transportation. The fact that this city is built in the water allowed it to become a very wealthy trading hub during the middle ages. Piazza San Marco: This is most famous piazza in Venice, and it serves as the political, social, and religious center of the city. The primary landmark here is St. Mark’s Basilica, the church that serve’s as the city’s cathedral. The piazza also houses St. Marks Campanile, the most recognizable landmark of the city. Interesting fact: This bell tower is an exact replica of the original that was constructed in the 1100s. It collapsed in 1902 and the rebuilding was complete in 1912. Grand Canal: This is the main waterway of the city that runs through its center. It starts at the basin in San Marco and goes down to the lagoon near the St. Lucia rail station. You can ride down this canal to see the houses of formal nobles and the other beautiful buildings that line the passage. Note that Venice is occasionally hit by some flooding. This is something that I experienced on my visit several years back. Just watch the weather before your trip and pack appropriately! Planks for walking on flooded streets – we had lots of rain on our visit! Milan is known as one of the fashion and design capitals of the world (not sure who is ahead between Paris or Milan – ha!). It has an interesting history as it was founded by Celts who came down to the region in the 6th century BC, but of course was eventually conquered by the Romans. Milan Cathedral: This cathedral is the largest gothic-style cathedral in the world. It took nearly six centuries to complete, with Napoleon actually holding responsibility for finally wrapping up the construction. You can tour the building as well as the roof, where you can take in nice views of the city. Convent of Santa Maria delle Grazie: This convent houses the original mural of The Last Supper by Leonardo di Vinci. This makes for a short visit, but I really enjoyed this – the size of the mural helps you experience the painting much differently than you typically do in textbooks or other reproductions. 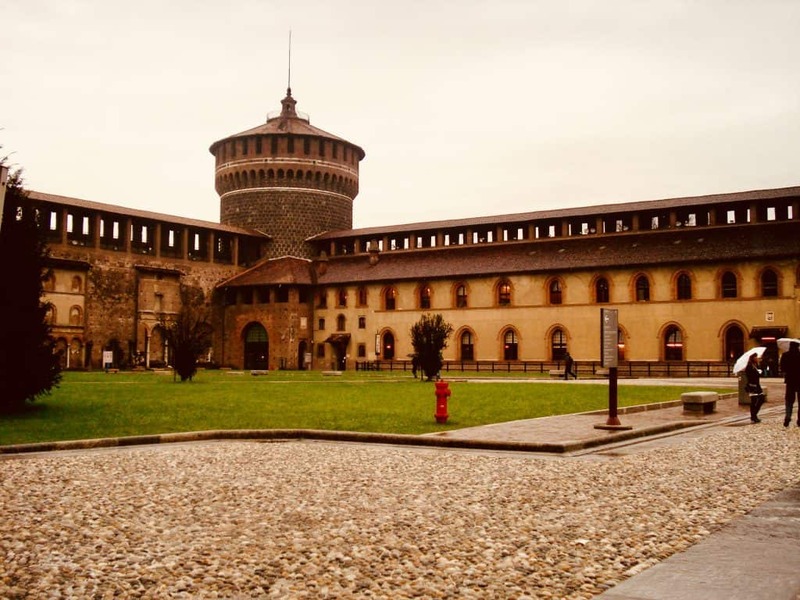 Sforza Castle: This castle was formerly the residence of lords, like Francesco Sforza in the Middle Ages. Like many other buildings in Milan, Leonardo di Vinci also decorated the interiors of this building. Today this castle houses several museums, such as the Museum of Ancient Art and the Egyptian Museum. 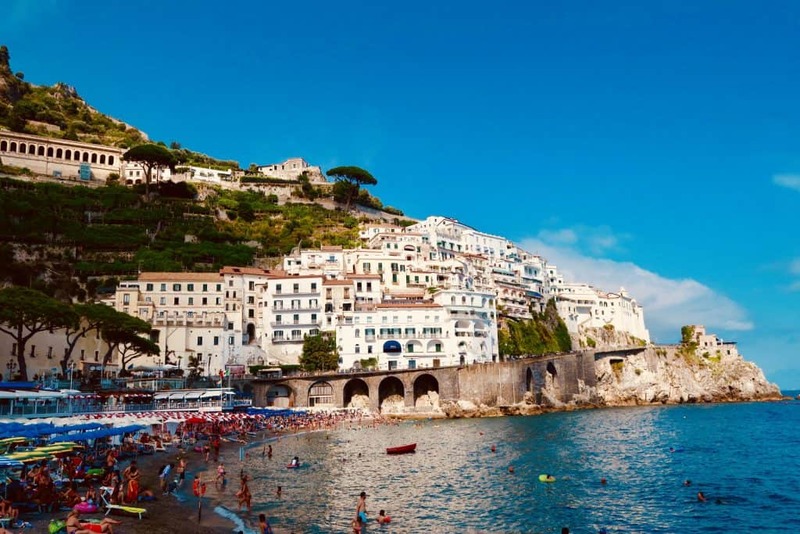 I’ve listed Amalfi here as just one of the cities the make up the Amalfi Coast, but I’d recommend visiting any of them. I had always heard about the Amalfi Coast being great, but couldn’t really appreciate this until I went for myself. The views are breathtaking and there are colorful flowers everywhere. There are mountains that appear to touch the sky full of colorful houses but also beaches for swimming. I personally which I could have stayed longer myself, so I want to head back soon. Amalfi does get a bit of flack for being touristy, but I think its still worth the visit! Oka yes, Pompeii is not a currently inhabited city (although it is within the modern city of Pompei), but it is amazing! I just returned from a trip to visit these ruins, and I was in awe of the scale of the ancient city. You could spend a day exploring the streets of the city and probably still not see everything. For me personally, I felt as though I could really understand life in an ancient city for the first time, as the city is still amazingly intact. If you are a history buff, you cannot miss this one! To get to Pompeii you can take a short ride from Naples. 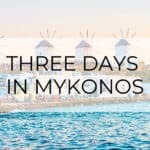 My family and I took this tour (also shown below) from Naples to Pompeii and the Amalfi Coast; which is a great option if you are short on time. 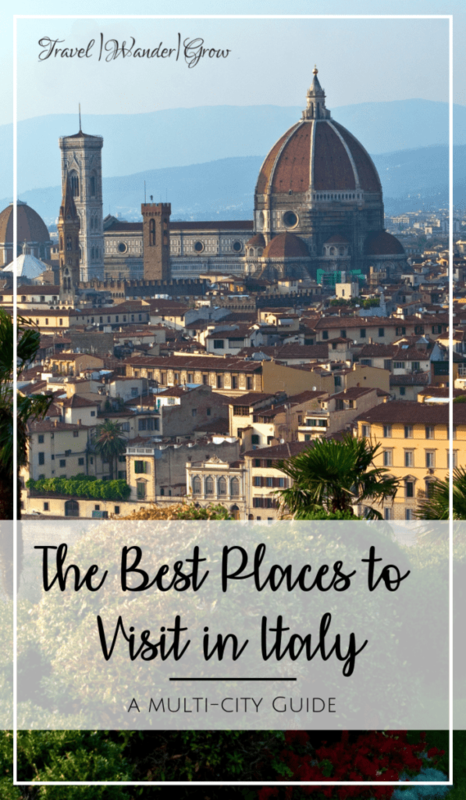 That wraps my list of the best cities to visit in Italy – for now at least! Overall, I think that one thing that ties all of these cities together is the relaxed culture and delicious food (similarly to Spain). You probably noticed that I mentioned Naples above, but did not give many details. This is because while I stayed there in one night, I actually saw nothing in that city. All of that to say, I will update this post further as I explore more of Italy :). How about you? What are you favorite places to visit in Italy? Let me know below! 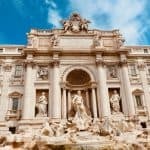 Very informative, and thorough article on visiting Italy. I have always wanted to tour there, as I have heard it is a beautiful country. From your pictures, and descriptions I am even more impressed, and am now resolved to go there as soon as possible. I will bookmark your fabulous post, and refer to it as I make out my itinerary. Thank you for sharing this most useful information. Hi Tom – I’m glad you found this post useful! Please let me know if you have questions as you start to plan your trip. How lucky you are that you have gotten to visit some of these wonderful places. I have always dreamed of visiting Pompeii. I just love the history and scenery that you see in documentaries of the area. It is definitely on my bucket list. Did you find Amalfi to have more English speakers than some of the other areas since it is more touristy? I visited Rome many years ago. Ever since then, I intend to visit the beautiful city again, and explore the rest of Italy. Your article has inspired me to set this intention in motion again. And this time round, it won’t just be Rome. I see many ideas from your helpful post – Venice, Milan, Florence, Amalfi and Pompeii. They all look so interesting. And the photos and videos really help. How many days should I spend on each city? 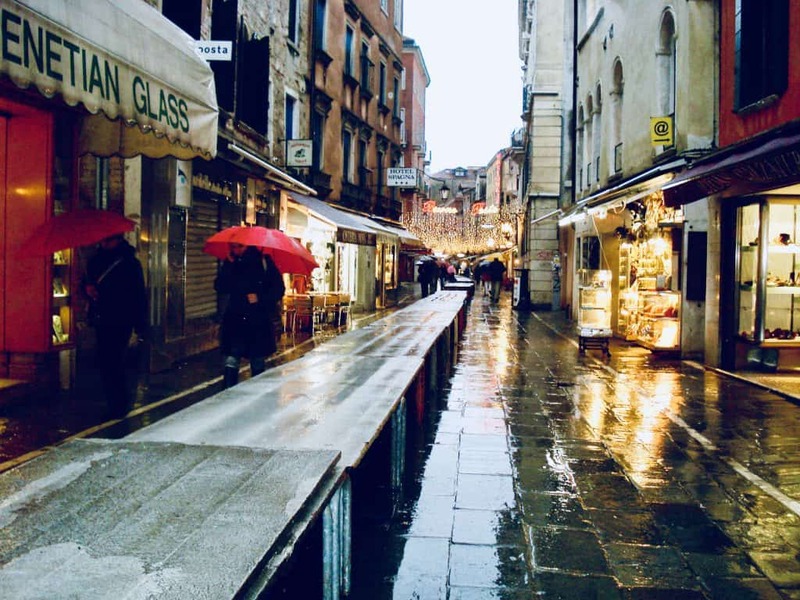 I would do about 2 or so in Venice – you can really see everything there in a short amount of time. Venice and Milan I’d give at least 3 days each. Pompeii is not far from Amalfi, so you could probably spend 5 or so day in that area to really see everything, and maybe wrap in Naples too. Of course, you can modify to what fits your schedule :). Hope that helps! Hi Frank – Glad to hear that you are planning to travel more :). If you are going the budget route, I’d recommend going off season (in the cooler months) as prices are always lower at that time. I would save about $1500 for the two of you for hotels / activities. And use a site like scottscheapflights to find good deals on airfare! I’ve seen prices as low as $300. Hope that helps! Pompeii! I had one of the greatest nights of my life in Pompeii. Can I share my post on Pompeii here? Thanks for sharing your visit to Italy Christen. I love you calling out the Roman Forum! Often overlooked. I cannot wait go visit Italy! Thank you for the info! Hi! from the first page i overall just love your website and content! Ive been to venice and it is what you say and more. Im now particularly interested in Amalfi because of you so thank you! Do you know any places where surfing can be done? Thank you!! Such a great post! I love Italy. Rome is a gorgeous city and the Amalfi Coast. What can I say. We just returned from Spain where we walked the Camino. Have you been there? Beautiful too. So many gorgeous countries on this earth! Your video of Pompeii is great to. I loved it there. Thanks so much for a really cool post on a really cool country! Glad you like the post, Kevin! I have not been to Camino, but sounds like I need to check it out! 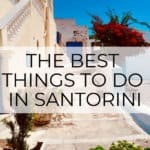 I will visit Italy one day, and your tips will definitely make my experience a better one. I will try to remember or even re-visit your post to make sure I don’t miss out on anything when I finally get to travel to Italy. It is such a beautiful country, from what I’ve heard an seen online and on TV. Thanks to your post, now I have a better idea on what to look for when thinking of what cities I’d like to see first. Glad this helps, Anthony! If you have questions as you plan, feel free to reach out! This is a beautiful post! Really captures the spirit of your site. 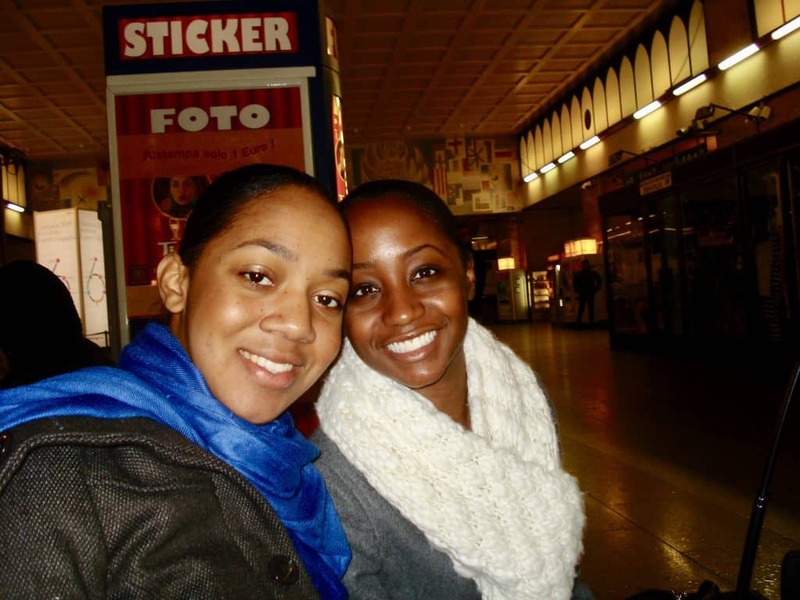 I have always wanted to travel to Italy; my sister recently went to Sicily on her honeymoon! What is your opinion of Sicily? I’ve been to Palermo and a few small towns in Sicily and found it to be quite charming. Definitely worth a visit! Italy is my favorite country. 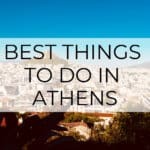 Great tips to know for the next time I visit! Great, let me know if you have questions on anything! Thanks for the fabulous article. Such a wealth of information here. I toured Italy 25 years ago in an old Kombi Van. Such a beautiful country. Oh really? That’s really cool! I agree, it’s wonderful there.